Well you can't say this was a waste...I think I've used this snowman to the fullest! Are you tired of seeing him on EVERYTHING here lately? LOL! Good thing Christmas is almost here and this is the final snowman project. I love that my Stampin' Up! stuff makes giving little things like a bag of fudge so much more special! Merry Christmas blog friends. Enjoy your time with family and friends...and tune in tomorrow to see what Santa brought these handsome guys! Hi Becky, I bought the snowman tutorial after I saw it on your blog this week. I adore snowman! I made some with my 19 year old daughter. Merry Christmas from the MacKay's in Maine. We'll be thinking of you as you spend your first Christmas without your Dad. The first Christmas after my mom died, we watched home videos so we could hear her voice. : ) Thanks for all the inspiration you give on your blog...love the little snowman! Merry Christmas! I too, bought the snowman tutorial...........fun to make and oh so cute! 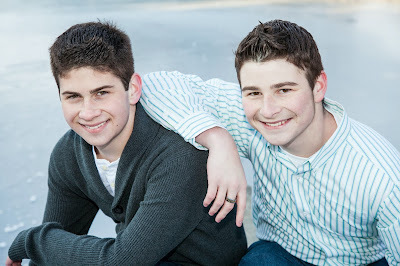 Your boys are SO handsome, and they just sparkle with personality!! Cute snowman. Merry Christmas to you and your family. I look forward to seeing your things to come in the New Year. Thanks for sharing the link to the snowman tutorial. I purchased it and used it . . . not as many times as you did! He is really cute and I love that she did it to raise money for Christmas gifts. What gorgeous boys. Bet your phone rings off the hook every evening. what handsome men you have there...love ya and Happy New Years!